In todays SaaS world, user signup usually requires email confirmation because of continuous events that trigger new email messages to users. AppFuse is a RAD Java web app framework, supporting a multitude of web frameworks: Spring MVC, Struts2, JSF, Tapestry, and there are more to come. Let's implement a user signup email confirmation service for AppFuse. This can be adapted to any other Java web app framework. How can we verify a new user's email? 1. A new user signs up and fills in an email address which we want to verify as valid. 2. After the user submits their data, we'll generate a unique and difficult to guess token for each that signs up. The new user won't be able to log in until they complete their email verification process. 3. We'll send an email with a URL from our app which will include this generated token. As AppFuse supports multi-language, we'll generate the email in the active locale. 4. When the new user receives the confirmation email, they will be able to visit the included URL with unique token to say "Hey, it's me. I've received your difficult-to-guess token at the email address I gave you". We will mark then this user as confirmed. Ok. Let's add a new Java interface for our new Signup confirmation service. The service will be responsible for starting a user's data confirmation process and confirming the user's data. We will apply it to email verification, but it could be applied to mobile phone number verification as well. Hold on. What is this WebAppContext type? We'll need to include our web app URL in the generated email. As we'll implement the confirmation in the service level, we'll avoid to add an unnecessary dependency to servlet classes. After all, we're working at the service layer. We add the dates for administration purposes. We can now write an implementation for our new SignupConfirmService to verify a new user's email address. Our implementation will use AppFuse MailEngine service to send email, a ResourceBundle for mail subject i18n, and the Java SecureRandom class to generate a unique and difficult to guess token for each new user. Tests run: 3, Failures: 0, Errors: 1, Skipped: 0, Time elapsed: 0.584 sec <<< FAILURE! testAddAndRemoveUser(com.operatornew.service.UserManagerTest)  Time elapsed: 0.082 sec  <<< ERROR! com.operatornew.service.UserExistsException: User 'john' already exists! Tests run: 5, Failures: 0, Errors: 1, Skipped: 0, Time elapsed: 0.168 sec <<< FAILURE! testSave(com.operatornew.webapp.action.SignupActionTest)  Time elapsed: 0.064 sec  <<< ERROR! All our tests now pass. To enable your account, please click in the following link or copy it onto the address bar of your favourite browser. After that, the test passes. After implementing the service layer, we can now implement the web layer. When a new user clicks on the sing up link, a page with a fill-in form is showed and the user enters their info. 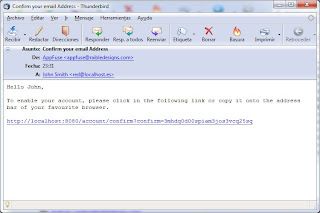 After completion of the form, the user will press the signup button and, if configured to confirm email before the account is enabled, a page will be displayed informing the user that an email has been sent to their email address and they need to confirm their account by following email instructions. In AppFuse with Struts2, the SignupAction class implements the Struts2 action for Signup. The save() method currently saves the new signed up user, sends them an email of signup welcome and logs the new user in. We will change the implementation by calling the new UserManager.signup() method, eliminate the welcome email and only will log in the new user if the app is NOT configured to confirm email before the account is enabled. 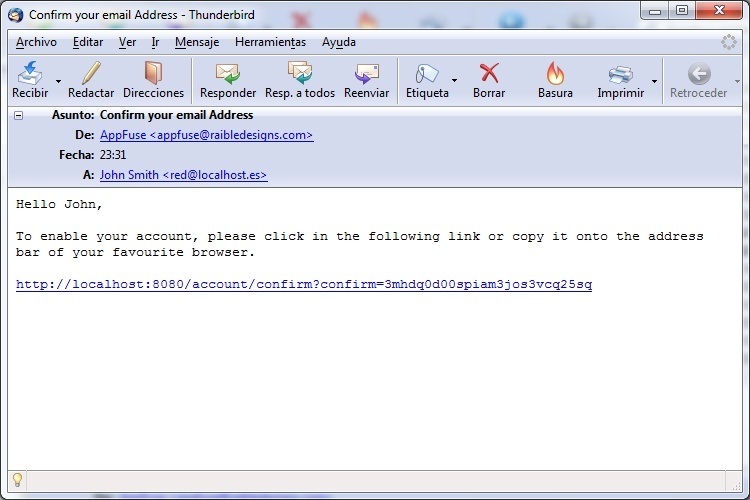 It displays a message informing to which email has been sent the message explaining the user what they need to perform in order to complete the signup process. The other two new jsp pages are very similar to this one. Here are some screenshots of the added functionality. Sources can be found here. thank you so much for this. you're superb!! this is great. Was searching for this. Will try implement it and will post my result.